If you’ve ever been to New Orleans, or heard even one thing about it at all, then you know how seriously this southern city takes its cocktail culture. NOLA is credited for inventing classics like the Sazerac and the Hurricane -- which is why Ruth’s Chris Steak House, which opened its first location in the city, honors those two (and others) on its bar menu. 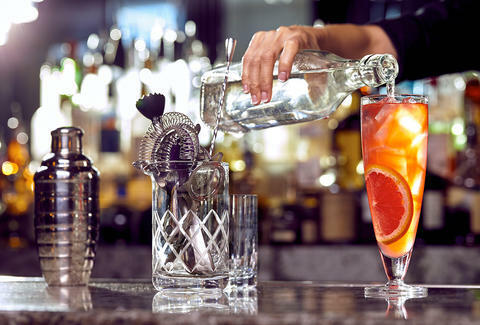 While it started as a single New Orleans restaurant more than 40 years ago (thanks to determined mother-of-two Ruth Fertel), Ruth’s Chris now has more than 150 locations, and after revamping its drinks program to play on its heritage, they are each a go-to place to get a classic NOLA cocktail. Need to know more? Let the drinks -- made with fresh-pressed juices, premium liquors, and house-made syrups -- speak for themselves. 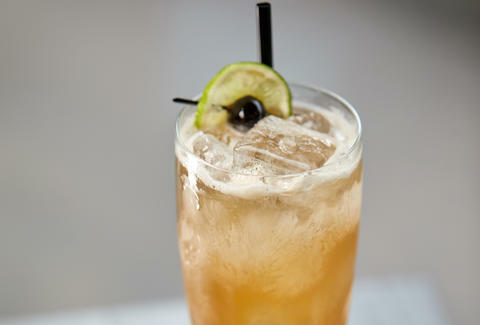 Backstory: Ruth’s version of a Hurricane pays homage to the great Pat O’Brien and his namesake New Orleans bar where this tropical cocktail was invented in the 1940s. As the story goes, O’Brien and partner Charlie Cantrell’s liquor distributor only agreed to sell them whiskey, bourbon, and scotch if they also agreed to buy many cases of rum. To use it up, they created a drink using rum, passion fruit syrup, and lemon juice, and well, you can figure out what happened next. Ruth’s take: What sets the Big Easy Hurricane apart is its use of fassionola syrup, an ingredient from the tiki boom days that “kind of got lost in the ages and [is starting to experience] a revival,” according to Kelly Hendriksen, who oversees menu and beverage strategy for Ruth’s Chris Steak House. Max Messier of NOLA-based Cocktail & Sons makes the handcrafted syrup (the only one on the Ruth's Chris menu not made in-house) -- and it’s no easy feat. Starting with strawberries from Pascagoula Parish, “a region in Louisiana where they grow the best, juiciest, most wonderful strawberries,” he combines three syrups (hibiscus, strawberry-lime, and tropical fruit) to make the fassionola that goes in every hurricane at Ruth’s Chris. “It’s awesome to have an entity with multiple locations all over the country carry fresh-juice, small-batch syrup,” Messier says. Pair with: Seared Ahi Tuna. The fruity flavors of the fassionola round out the spice of this tuna, which comes alongside a sauce with hints of ginger, mustard, and beer. It’s a tropical vacation for your palate. 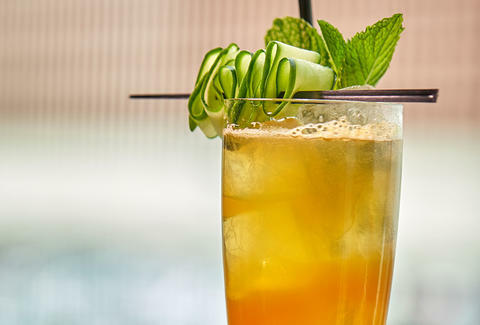 Backstory: Though it didn’t originate in NOLA (we have our British brethren to thank for this one), the Pimm’s Cup is a huge part of this cocktail capital. In the 1940s, Napoleon House bar and restaurant borrowed the aperitif and it soon became their signature drink. The appeal? It’s a light and refreshing thirst-quencher, ideal for New Orleans summers. Pair with: Spicy Shrimp. The Cucumber Cup cools down your palate from these succulent large shrimp, which are lightly fried and tossed in a spicy cream sauce, while complementing the tangy flavors of the cucumber salad that comes on the side. Backstory: This sparkling wine cocktail doesn’t just sound like New Orleans, it’s like a liquid embodiment of the city’s history. First recorded in the 1922 book Harry’s ABC of Mixing Cocktails by Harry MacElhone, the “French 75” got its name from a light-but-mighty French gun used during WWI -- a nod to the drink’s potency. 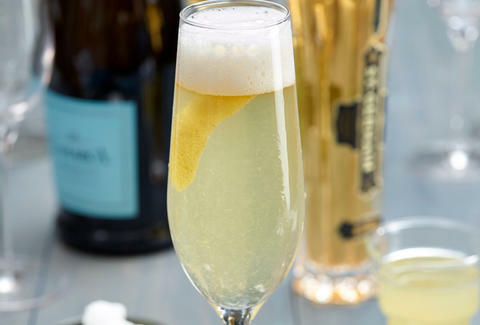 The simple combination of gin, Champagne, lemon juice, and sugar became a NOLA staple thanks to the bar at Arnaud’s (which was later renamed “French 75” after its signature cocktail). Pair with: Stuffed Chicken Breast. The layers of flavor from the gin combined with the creaminess of the bubbles pair well with Ruth’s double-breasted chicken, which is roasted with thyme, stuffed with garlic herb cheese, and topped with lemon butter. Backstory: Though popular in NOLA, this drink’s origin dates to colonial-era America and England, when brandy (in place of bourbon) and milk were thought to have medicinal properties -- it was even beloved by the likes of Benjamin Franklin and Queen Victoria. As its name denotes, it was originally made and served in a punch bowl, and because of its shelf stability, became popular as a bottled drink. A version called clarified milk punch has gained popularity in recent years (in which hot milk is added to the booze to make it curdle, in order to skim off the solids) but don’t be confused -- the New Orleans-style cocktail is served chilled, using whole milk or half & half. 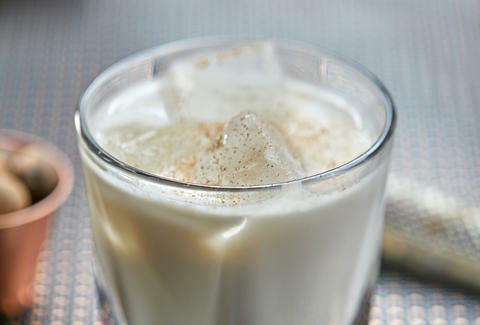 Ruth’s take: In the Crescent City and throughout the south, milk punch is a holiday cocktail (similar to eggnog), but at Ruth’s Chris, it’s a dessert staple. Hendriksen notes that since punches were one of the original cocktails, it was important to include a punch in their bar program. “[It really] speaks to both our New Orleans heritage as well as cocktail history in general,” she says. Pair with: Sweet Potato Casserole. If you don’t want a drink this rich (Ruth’s is made with half & half) alongside a decadent dessert, opt instead for the sweet potato casserole side dish to end your meal. The creamy vanilla flavors in the cocktail balance out the the savory flavors of the whipped sweet potatoes topped with a pecan crust. Backstory: We know what you’re thinking: While there’s nothing explicitly “New Orleans” about a Moscow Mule, Ruth’s is honoring the cocktail boom and vodka craze of the 1950s through this representative drink -- and giving it their own Big Easy-style twist. Ruth’s take: You don’t mess with a cocktail when it’s reached peak perfection. That’s why Ruth’s barely touched their Moscow Mule. 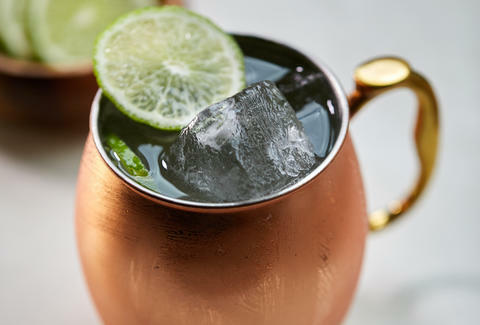 Instead of using ginger beer, which Hendriksen says can taste pretty different between all the different brands, the NOLA Mule uses Ruth’s house-made spicy ginger syrup. It nods to “the spiciness of New Orleans [while keeping] the classic flavor,” she adds. It also means you’re getting a consistent cocktail every time. Pair with: Chilean Sea Bass. The delicate fish is pan-roasted and served over sweet potato and pineapple hash and topped with citrus coconut butter -- complex flavors which complement the heat and mild sweetness of the ginger syrup in the mule. Backstory: No ode to New Orleans cocktail culture would be complete without the Sazerac, arguably the most iconic NOLA invention. Apothecary Antoine Amédée Peychaud came up with the Sazerac as a sort of happy accident in 1838. After creating his namesake Peychaud’s bitters as a medicinal tonic, he put it in a brandy cocktail and served it to friends. Ruth’s take: Almost 200 years later, Ruth’s Chris is doing (almost) the same. “Traditionally, the Sazerac started with cognac, and over the years switched to rye whiskey,” Hendriksen says. “We did a play on the base spirit with a half cognac-half rye, so it really brings out the spicy notes of the whiskey but [also] the subtleness and refinement of the cognac.” The resulting taste, she adds, is sophisticated and complex. Pair with: Bone-In New York Strip. A drink this classy calls for none other than a New York Strip -- that 19-ounce, full-flavored USDA Prime steak (which happened to be the favorite cut of Ruth herself). 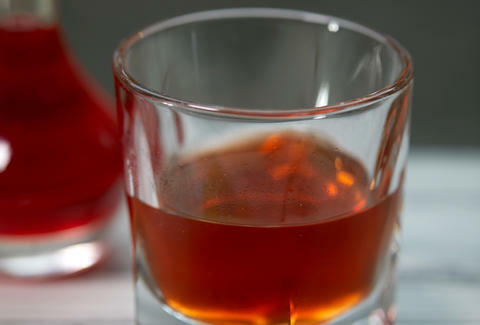 Plus, the boldness of the Sazerac combines perfectly with the richness of the steak. Now, would you like your NOLA-history-in-a-glass shaken, or stirred?